Do you offer monthly or automated renewal subscriptions? All of our real time lead packages and a few of our aged lead packages are sold on an automated subscription basis. You can modify or cancel your automated subscription at any time without affecting any of your current uncompleted orders in the "My Invoices" tab of your Leads Administration Panel or the contact management system. Our order processing and delivery system is fully automated. For most current customers leads will begin delivering within 60 minutes after placing their lead order. You will receive an email notification once your order is accepted. New customers and orders needing verification may require phone validation before delivery begins. If you need to locate or verify your order, call us at (888) 455-3237 x2. ; (888) 455-3237 x2 from Monday to Friday 8:00am - 4:30pm MST/Arizona., Monday through Friday. How are the leads delivered to me? The leads are delivered to your email address. Each lead may also be viewed within the "My Prospects" tab of your Leads Administration Panel or the contact management system. Your login information is emailed to you at the time your order is accepted. If you are a current customer you may log in to your account at any time. Do you offer geographic or gender sorting? Yes, you can customize most of our lead packages at the time of ordering. Depending on the lead you select, you can target by area code, time zone, state, country, gender or any combination. Additional charges may apply depending on your selections. Do you re-sell the leads to other people? Our real time leads are semi-exclusive, sold an average of three times. A lead is never sold more than once to the same business opportunity. This semi-exclusivity has set an industry standard of excellence as this results in our leads being very responsive and providing leads that are willing to hear about your opportunity. Our proprietary lead management and lead delivery system ensures that leads are always adequately distributed and never over-sold. How do you generate your leads? We generate all of our leads using an exclusive publisher network, business opportunity portals and search engines. 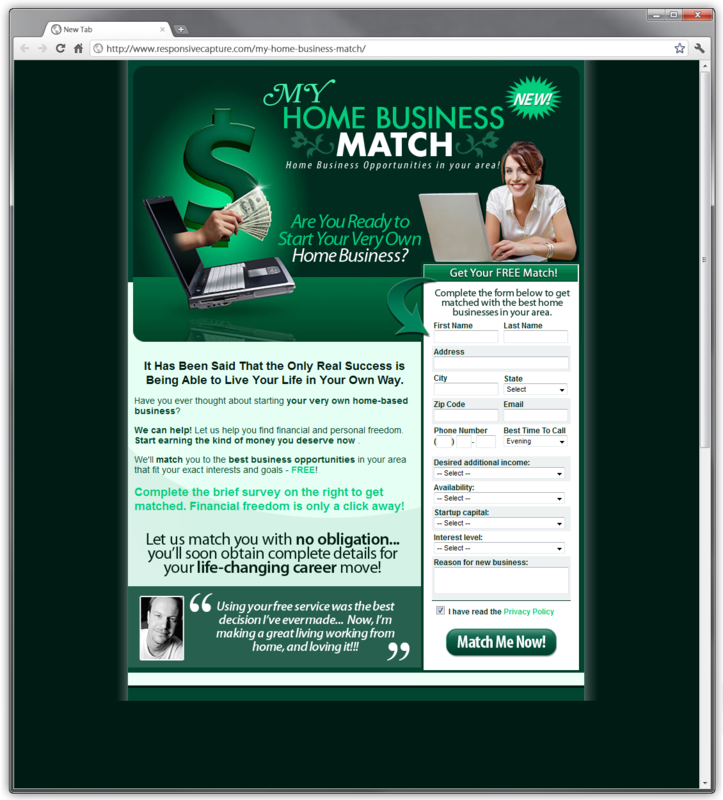 Each lead completes a professional, non-incentivized capture page looking for more information on a work-from-home opportunity. Click here to view an example lead capture page. Do you provide the IP address & timestamp with the leads? Yes, all of our leads contain both the lead's unique IP address and time stamp. The IP address identifies the lead's source and the time stamp provides the exact time the lead submitted their information. This information is imperative for email marketing. Do not purchase leads if the supplier is unable to provide an IP address, a time stamp and show you how they generate their leads. Plus this information is generally imperative if you wish to upload your leads into a management system or an auto-responder system. It may also be required by your ISP in the event of a complaint. Are the leads mine to keep? Leads are available for a period of sixty days from the date the lead is delivered. You are not authorized to re-sell or give away a lead to any other party. When emailing the lead or calling the lead please be courteous and always, if they request, give the lead an option to be removed from your email list. Is there a time limit for me to use my Real Time Lead credits? Yes, Real Time Lead and Traffic credits must be used within sixty (60) days from the date of purchase, or they will expire. No refund will be offered for unused expired lead credits. Can I speak to a company representative directly? Yes, call us toll-free at (888) 455-3237 x2. Our business hours are (888) 455-3237 x2 from Monday to Friday 8:00am - 4:30pm MST/Arizona., Monday through Friday. Do you offer an Invalid Lead replacement policy? Yes, for your convenience we offer a full lead replacement policy with automated status reporting for Invalid Leads. In the event that you receive a lead with a disconnected phone number, a wrong telephone number, or from a minor you simply need to submit it as an Invalid Lead with the click of a button. Replacement leads are validated and responded to within 7 business days from the date of submission. A lead credit is added to your order quantity when a lead is confirmed as invalid. You can monitor the status of each of your submitted Invalid Leads in the "Tickets" tab of the Help Desk section of your Leads Administration Panel or the contact management system. Can I control the flow and delivery schedule of my leads? Yes, we give you complete control over the flow of your leads. With real time leads you get to stop and start (Pause and unPause) your lead delivery as often as you wish. You can also specify a Daily Cap which is the maximum number of leads you wish to receive per day. Please note aged leads are delivered in a single batch and therefore do not have a stop and start delivery feature. Simply purchase a package of Leads. Once you have ordered your leads you will be emailed your order confirmation and log in information. If you subscribed to the contact management system you would log into it. If you did not subscribe to the contact management system you would log into your free online Leads Administration Panel. Once logged in to either system you can view and manage your lead order in the "My Invoices" tab. If you need any assistance or have questions please call us at (888) 455-3237 x2. ; Monday to Friday (888) 455-3237 x2 from Monday to Friday 8:00am - 4:30pm MST/Arizona..